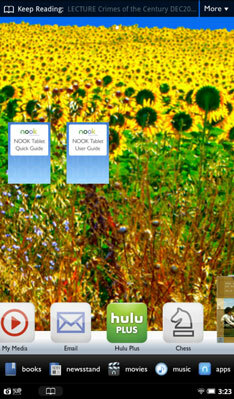 The 16-million-color high-resolution display that sits behind the NOOK Tablet Home screen is a terrible thing to waste. You can select from patterns and pictures that come with the tablet, but why not post one of your own photos as the wallpaper? You can change the wallpaper from the Home screen or by going to the Settings screen. On the Home screen, press and hold the existing wallpaper. Another dialog box offers two choices. Tap Wallpaper Gallery or Photo Gallery. An image you have directly downloaded to your NOOK Tablet from a website or grabbed as a screen capture. If you decide you don’t want to change the wallpaper, tap anywhere outside the dialog box to close the menu. Or click the Cancel button in the gallery menu. Tap the Set Wallpaper button.